Coaching director Scott Johnson will leave the Ospreys at the end of the season to take up the role of Scotland senior assistant coach. Johnson confirmed his departure and the Scottish Rugby Union announced that he will be available for the June tour to Australia, Fiji and Samoa. "I will not be looking to renew [my contract] at the end of the season," said the 49-year-old Australian. Scotland coach Andy Robinson has been seeking an experienced coach. Johnson added: "When I joined the region I had a remit to help set-up systems that would enable us to bring through home grown talent, coaches and players, a challenge I've thoroughly enjoyed getting my teeth into over the last three years. "I feel that now is the right time for me to move on to other challenges but I remain 100% committed to the Ospreys between now and the end of the season." Johnson's role with Scotland is thought to also include some involvement with Glasgow and Edinburgh. Ospreys chief operations officer Andrew Hore said: "It is a huge disappointment for us to be losing Scott at the end of the season, but we understand that he feels it is the right time for him to move on to other challenges having served the three years he committed himself to us for originally." Hore added: "By informing us of his intentions at this early stage, it allows us to use this time to consider our next course of action and the options available to us as we plan for the future." Managing director Roger Blyth said: "While he has brought silverware to the Liberty Stadium and we hope that will be the case once again this season, the real legacy he will leave is the systems and structures he has helped to develop that will allow us to continue leading the way in Wales." Johnson joined the Ospreys ahead of the 2009-10 season, leaving the role of USA Eagles national coach to do so. He first arrived in Wales as a skills coach during 2011 World Cup winning coach Graham Henry's reign and was assistant coach during the Steve Hansen and Mike Ruddock eras. Wales won their first Grand Slam in 27 years under Ruddock in 2005 and many credited Johnson with playing a key role in that achievement. Johnson became Wales caretaker coach during the 2006 Six Nations following Ruddock's controversial departure. In March 2006 Johnson became one of John Connolly's assistant coaches and selectors ahead of the Wallabies' 2007 World Cup campaign. 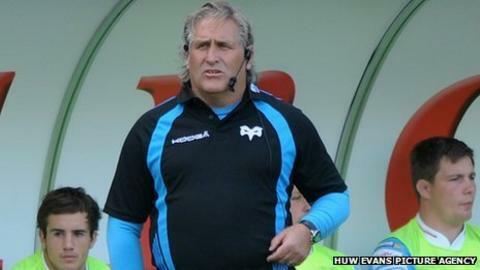 In 2008 he became USA coach and left the following year to return to Wales with the Ospreys. During his time at the Liberty Stadium, they reached the 2009-10 Heineken Cup quarter-finals where they were defeated 29-28 by Biarritz. A year later they bowed out after a tough pool stage featuring Munster, Toulon and London Irish and this term are struggling in the competition having drawn 26-26 in Treviso and lost back-to-back games against Saracens in Pool Five. In what was the Magners League, the Ospreys' greatest triumph came in Johnson's first Ospreys term, a 17-12 win over Leinster in Dublin in the tournament's inaugural Grand Final. Ahead of the 2011-12 season they lost high-profile players James Hook, Lee Byrne, Jerry Collins, Marty Holah and Mike Phillips and were without a glut of Test stars playing for Wales, Ireland, Scotland and Samoa at the World Cup. But after a strong start in what is now the Pro12 League, the Ospreys lie second to Leinster with eight wins from 11 games. Wasps coach Dai Young and Johnson coached the Barbarians when they beat Wales in June, 2011. Johnson was Wales' observer of Sir Clive Woodward's British and Irish Lions back-room staff during the ill-fated 2005 tour to New Zealand. Scotland coach Robinson was a Woodward assistant on that tour and has sought someone of the right calibre to be his right-hand man. "I am delighted Scott has agreed to join the Scotland coaching team. I have huge respect for him as a coach and a person having coached against him on numerous occasions," Robinson said. At the 2011 World Cup Scotland failed to reach the quarter-finals for the first time and Robinson is keen to emulate the template that brought the All Blacks success at the tournament. Graham Henry had Test-hardened coaches in former Wales coach Steve Hansen and ex-All Blacks head coach Wayne Smith as his assistants. Johnson's solicitor, Duncan Sandlant, of Esportif international, had indicated that Scotland was not his only option, saying: "Scott has a number of options which he is seriously considering." The Australian had been linked in reports in New Zealand with a role as assistant to new All Blacks head coach Hansen. But Ian Foster's appointment as one of Hansen's back-room staff made such a move unlikely for Johnson.